As tuition costs rise and the number of low-income students increases, at least 14 Texas colleges have opened food pantries for students who are having trouble affording meals. But lately, college administrators have discovered that some of their students face a different reality. Many are struggling to find enough to eat. As a result, universities across the state have begun offering a different kind of meal option. All-you-can-eat dining halls are still a mainstay for students who can afford them. But now, campuses are also opening free food pantries to serve their needier students. In recent years, at least 14 colleges in Texas and hundreds across the country have opened food pantries, according to the College and University Food Bank Alliance. They range from big public schools like Texas Tech University and the University of North Texas to community colleges like Tarrant County College and Amarillo College. Most were created after administrators or students realized that food insecurity was a growing problem at their schools. “We want our kids to go to college, but a lot of them can’t afford nutritional and healthy foods,” said Ashlee Taylor, a graduate student at Texas Tech who worked with classmates to open a pantry there this semester. The reasons for opening them vary, but many campus officials cited two key factors. For one, the average cost of tuition and fees has increased more than 95 percent statewide since 2004, according to the Texas Higher Education Coordinating Board. Meanwhile, the number of college students from low-income families has grown. Many of those students get all or part of their tuition paid for, but with little or no financial support from their families, they struggle to keep up with other living expenses. Often, when choosing between paying for a meal or paying for tuition, healthy eating habits will be sacrificed. “A lot of students are pretty much just one step away from being food insecure because there is not much of a cushion there,” said Debra Reed, a professor of nutritional sciences at Texas Tech. 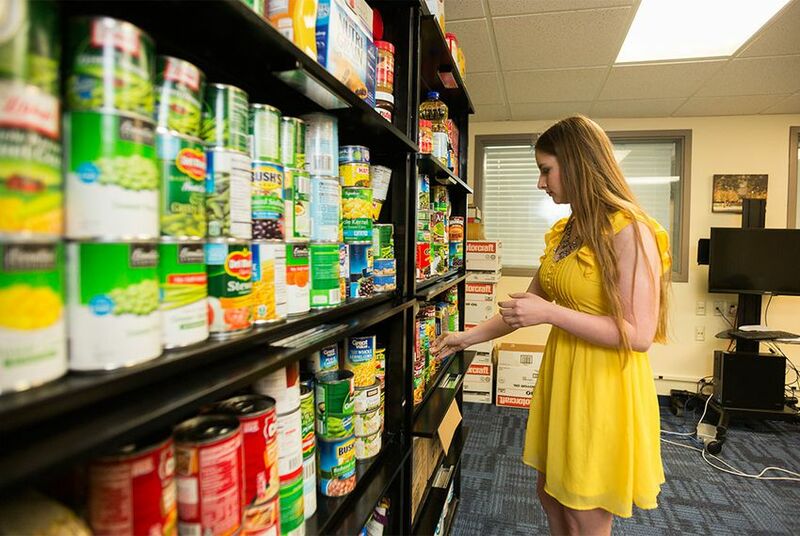 At the University of North Texas, the office of the dean of students opened a food pantry a little over a year ago after noticing “a number of students” were skipping meals. Some were attending school while homeless — they couch surfed in friends’ living rooms to get by, said Associate Dean of Students Rodney Mitchell. “Our stance here at UNT is that, with all of our students, we want to address all their needs,” Mitchell said. The pantry at UNT is similar to most of the others in the state. It is set up in a small room within the student union. Students can set an appointment or show up during open hours to pick through canned or dry foods, plus personal hygiene products and bottled water. There are no refrigerators, so fresh or frozen foods aren’t available. This academic year, students have visited the pantry about 500 times, Mitchell said. Many of the pantries are supplied by donations and staffed by volunteers. Maintaining them costs little, if anything. But their operations can provide a lifeline for students who may otherwise have to halt their education. The Texas Tech pantry opened last month and mostly caters to international students. Those students, many of whom come from Asia, are unfamiliar with the culinary offerings of Lubbock. Some have families that they need to feed but have visas that don’t allow them to work off-campus jobs. “Most graduate students make well below the poverty level,” said Taylor, who is president of the Tech’s Graduate Student Advisory Council. But as the pantries proliferate, their creators say they still need to work on convincing students to use them. Students may feel embarrassed or believe that struggling to put food on the table is a rite of passage for people in college. They need to understand that eating enough and staying healthy will help them succeed, said Catie McCorry-Andalis, dean of students at the University of Texas at El Paso, which opened a pantry about a year ago. And the food banks try to discretely give them that help, she said. “We need to make sure that there are virtually no obstacles and barriers to a student pursuing their education,” McCorry-Andalis said. Disclosure: Texas Tech University is a corporate sponsor of The Texas Tribune. The University of Texas at El Paso was a corporate sponsor of the Tribune in 2012, and The University of North Texas was a sponsor in 2014. A complete list of Tribune donors and sponsors can be viewed here.